Where to go when I don’t want a burger? Tough question. To make matters worse. I really wanted fries. If we go to a bar, I’m tempted to order a burger even though I go in there thinking I don’t want one. I have no will power. J had a rare Monday off and since we didn’t get to spend the weekend together, we decided to go out, do some shopping, and pick up lunch. A co-worker told her about a place that’s co-owned by Portage resident and Major League Baseball umpire Tim Welke. I had read a review in the Kalamazoo Gazette that raved about the fries a few weeks ago. On the surface, it seemed to offer everything I wanted. Penn Station is a chain of sandwich shops based in Cincinnati, Ohio. They have over 200 locations mostly in the Midwest and South. 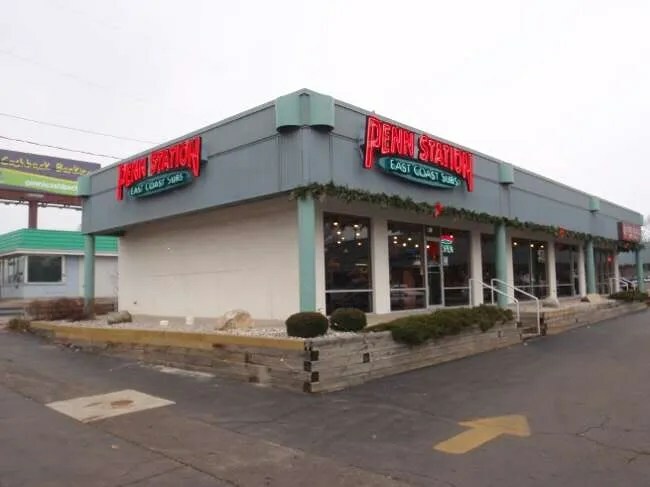 There are five locations in Michigan including the Kalamazoo store which is on Main Street in a strip mall near the Drake Road intersection. The store takes up a corner spot in the building. Penn Station prides itself on the fact that you can watch your sandwich being made. The restaurant is set up with a small dining room that runs the length of the space along the front. In the back is the order area, kitchen, and pick up window. The shop isn’t much different from other sandwich shops. You order at one end of the counter. If you choose to, you can watch your sandwich being built along the middle part of the counter. At the end, you pay the cashier and pick up your cup for drinks. The difference between Penn Station and most other sub shops is that the subs are toasted. Oh yeah, and the fries. I ordered an 8″ pizza sub. It came with pepperoni, smoked ham, provolone, parmesan cheese, and pizza sauce. You also get the option of adding sautéed onions, fresh mushrooms and sweet Italian sausage. I elected not to add any of those. I had planned on getting fries and a drink anyway, but there was some sort of special to add them as part of a combo. J wasn’t wild about any of the sandwich options, but settled on a 6″ Chicken Parmesan. 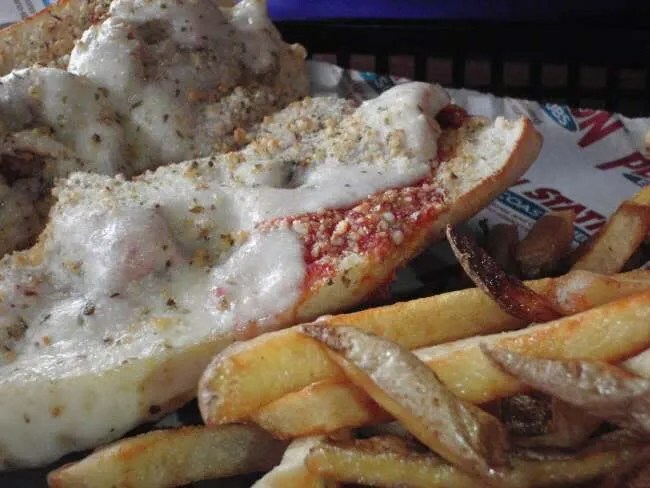 Her sandwich came with chicken breast, provolone, parmesan cheese, oregano, and pizza sauce. She also could have gotten fresh mushrooms and sautéed onions, but also elected not to. Her sandwich didn’t have a combo option, but she still got a small fry and a drink. After ordering, you go to the other end of the counter to pay. After that, take a seat and wait for them to bring your food out. They take your name when you order then just yell out the name in the dining room until someone answers. Primitive, but effective. I really liked my sandwich. The bread was nice and toasty and there was quite a bit of meat on it. The sandwich was the perfect size for me and I’m usually a pretty big eater. J wasn’t a huge fan, but she said it was alright. She’s just not a fan of chicken breast on sandwiches and didn’t really like the pizza sauce as a condiment. Too much to bite through. They didn’t have a warm sandwich that didn’t have a ton of meat on it. As we look at the menu now, we see there’s a “create-your-own” option. They don’t label it too well on the menu and both of us thought it was just another sandwich. 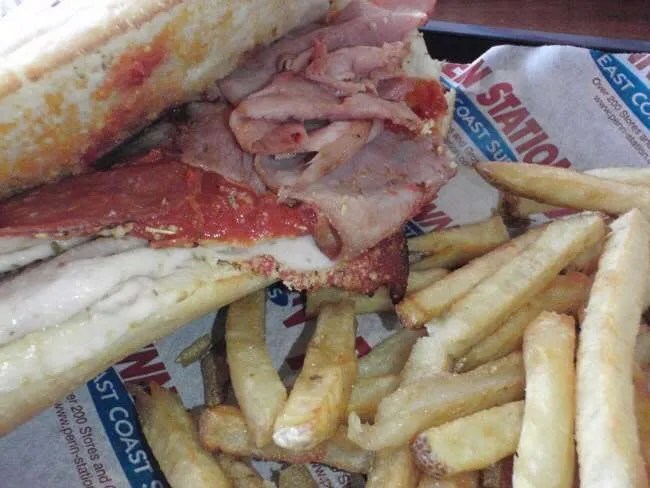 They call it “The Dagwood” which to me, sounds like a sandwich with everything but the kitchen sink. This options allows you to pick your meat, cheese, and veggies. 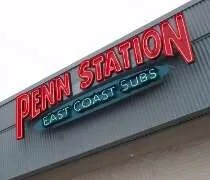 It probably would have been a better option for J.
I liked Penn Station. I think it’s a great option to the typical sub shop and I love that they toast the sandwich. The fries are great and, in my opinion, overshadow the sandwich. Our lunch cost a little over $15 and it took about 5-10 minutes for our sandwiches to come out. That’s really pretty good considering the dining room was packed and they were doing a pretty steady take out business as well. There’s a lot of options for sandwiches places now, but I really think Penn Station offers something the other chains don’t…. (great fries). Sorry, just another sandwich shop. Not impressed, hardly “East Coast” more like midwest mediocrity. Better off going to Mancinos, or Coney Island next door for true east coast flavor. The fries are ok, remind me of old school boardwalk fries at the mall. They should just be called “Penn Station Fries”. Thney have this huge bin of potatoes behind the counter and you can get a bucket of fries!. Make sure to order extra meat on your sandwich because if you dont, you will be eating mostly bread. Inside is very cozy, but has tacky industrial size condiments sitting on the shelves as decor, and it lacks character. I’ll agree somewhat on the sandwiches, but I love the fries. I’ve gone back since this review just for the fries. I’m a big fan of the fresh cut and they really do fresh cut. You two are nuts. This place rocks. The sandwich is better than any other sandwich in town. The fries are great and the lemonade is fresh-squeezed. Oh yeah, the chocolate chip cookie is tasty too. I really like this joint. We eat there quite a bit…but it’s always for the fries and lemonade. The sandwiches are alright, but the fries are to die for. Very happy one just opened in Portage closer to our house. Now I say go to W. Main for one reason, the management. I stopped in at the Westnedge store and was treated well by the employees (all the kids wearing regular penn station t-shirts) but the manager/owner (or whoever he was, some old guy in a maroon polo) treated us like garbage. He yelled out our names in the dining room like expected, however when we didnt answer the first time, since we were mid conversation with our friends, he yelled again, and sounded angry, when we raised our hands to indicate the order was ours, he then very slowly walked over, dropped our food on the table (didnt even bother to ask who had what order) and walked away like he was doing us a favor. All in all, the food is excellent, the staff is very courteous, the management definitely needs improvement.